To Stay Energy Efficient As You Age, Keep On Running : Shots - Health News People in their 60s who run for exercise use energy as efficiently as much younger people. That wasn't true for older people who walked instead. People use energy less efficiently as they age. Running seems to help prevent that slowdown. Walking is a simple thing that becomes really, really important as we age. Being able to get around on our feet for extended periods of time not only makes everyday life easier, it's linked to fewer hospitalizations and greater longevity. As we get older, though, the body takes about 15 to 20 percent more energy to cover the same terrain. And that can be a problem, says Justus Ortega, a kinesiologist at Humboldt State University in Arcata, Calif. "If people have more fatigue, they have less desire to participate" in walking, he tells Shots. It's easy to see how this becomes a downward spiral of feeling too tired while walking, then not walking and getting even more out of shape. Here's something that can prevent that slide: running. 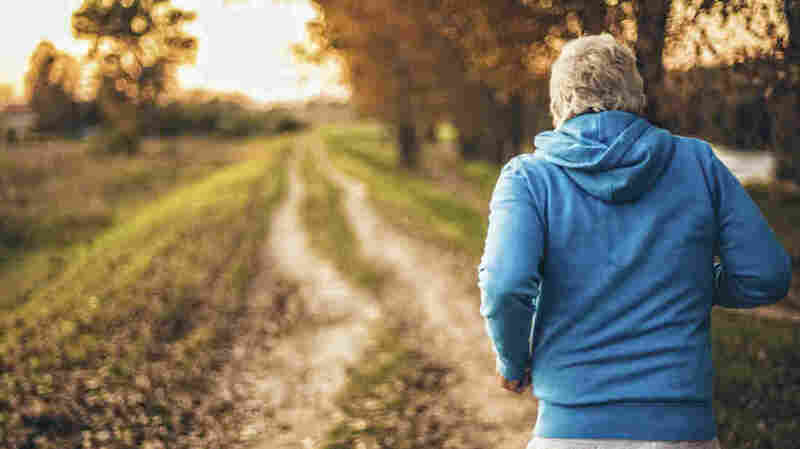 Older people who regularly ran for exercise had "walking economy" similar to much younger people, according to a study by Ortega and colleagues at Humboldt State and the University of Colorado, Boulder. 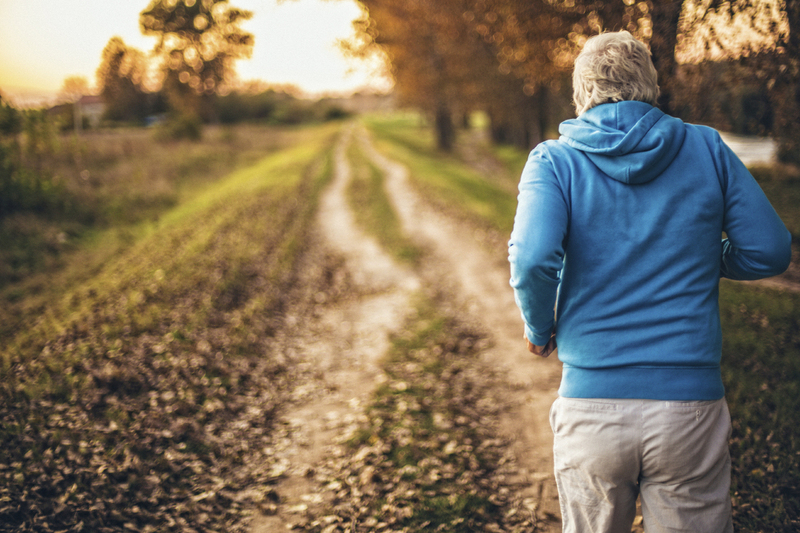 Older people who walked for exercise, however, while they were undoubtedly reaping the other benefits of walking, had walking economy similar to older, sedentary adults. In other words, the walking didn't beget more efficient walking, while running did. The study, published Thursday in PLOS ONE, took 15 men and 15 women with an average age of 69 who were already consistent runners or walkers. Participants walked on special treadmills at three different speeds and had their oxygen consumption and carbon dioxide production measured during their sessions. The runners consumed 7 to 10 percent less energy than the walkers. Importantly, there weren't any apparent biomechanical differences between the groups, such as differences in stride time or stride frequency that might account for the results. "If your car is using more gas to get down the road, you check to see if your brakes are rubbing, or if there's anything mechanical that might explain what we're seeing," explains Justus. So the brakes aren't rubbing. The next question is, "What is it about the engine using the fuel?" he says. One hypothesis is that the runners were more efficient at the cellular process that turns oxygen into ATP, the chemical form of energy that fuels the muscle fibers to move. "There's evidence to show that process is impaired with natural aging," says Justus. And research suggests that aerobic exercise can counteract that process. It's not 100 percent clear that's what's going on here. Another possible factor is muscle co-activation: older adults tend to use more muscles to perform the same movement than do younger people, perhaps to stabilize the joints. It's quite possible that runners, who are used to spending more time on one foot, use fewer muscles to perform a given movement than the walkers. That might contribute to their lower use of energy, says Justus. So the next step, he says is to analyze their data to see how muscle co-activation might be a factor. Other future experiments might look at other activities that are also more aerobically intense than regular walking, such as cycling or even very fast walking, to see if they might offer some protection. It's really important to mention that this research can't prove that running actually caused the better walking economy. Study subjects were already doing their preferred form of exercise before they entered the study, and it's possible that the runners had greater walking efficiency for some other reason. And by no means should this turn anyone off walking, says Ortega. "The health and social benefits you reap from walking are enormous," he says. But older folks who run may be getting a leg up on at least one element of walking performance.